By "all but the basic controls," I mean it. Grand total: shutter release, record movie button, iAuto button, on-off switch, flash release button, playback button, Q.MENU/Fn/Delete/Return button (yes four functions), and a control pad with a dial and a four additional buttons via edge presses. One last addition: the LCD is a touchscreen. In terms of performance specifications, the GF3 is a low-to-mid-pack shooter: 2 to 3 fps at full resolution, 7 shot raw buffer (unlimited with JPEG with a fast card), 1/160 flash sync speed, 1/4000 top shutter speed. ISO starts at 160 and can be set to up to 6400. Despite the very simplified design, there's not a lot missing from this camera over its predecessors. So the real question is whether you like the handling of the simplified design or not. Without a Mode dial, you may wonder how you set modes. Press the MENU button, select Rec Mode, rotate the dial around the Direction pad to the mode you want. It's no more cumbersome than the Sony NEX style of setting exposure mode, indeed it pretty much mimics it in some ways. Overall, I wasn't particularly bothered by the simplification. I can shoot with the GF3 just about as fast as I can the GX1, the Sony NEX-5, the Nikon V1, and most other mirrorless cameras I've reviewed. 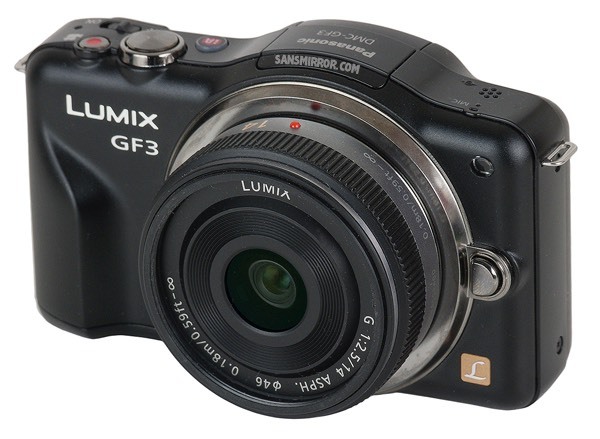 If anything, the GF3's control structure is a bit better than the E-PL3 and E-PM1 by a tiny bit. I did miss the top command dial, but don't dismiss this camera just because it doesn't have a button you expect. While not quite as complex as the other Panasonic cameras, the menu system is deep and wide. This is a bit of a good thing for serious users considering the simplified GF3, as it does give you some level of customization over the camera (at the expense of menu complexity). If you've used one of the other Panasonic bodies, you won't find much missing in the GF3 menus, which is a little odd, but as I note, welcome for serious shooters. Entry level shooters will probably avoid the menu system for the most part, as it's 19 pages (!) of terminology and complexity that will initially flumox them. Thankfully, you can pretty much avoid the menus for basic stuff. Non-cluttered and well organized come to mind when contemplating the GF3, with only the menu system detracting a bit from that. 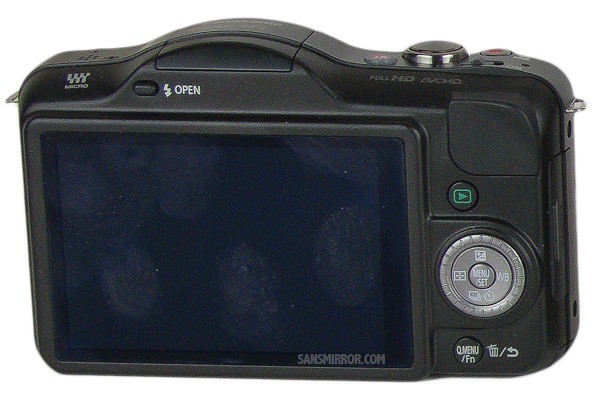 The inclusion of a plastic front grip is nice, but overall the camera is a little slippery to hold. You'll notice that if your hands are damp or there's a lot of moisture in the air (foggy days). While I like the plain look of the GF3, I kind of wish it had a more textured surface to it. That's strange, because the raw output of the GF3 is very slightly better than my E-PM1. The E-PM1 seems to have a bit more color noise to it than my GF3, especially at ISO 1600 and 3200. Overall, I can get very reasonable images out of ISO 1600 GF3 raw files. At ISO 3200 I start to struggle to get the kind of image I want; we noise level is just starting to get out of the correctable without major consequences range. I was a little surprised to see that Olympus got clearly more dynamic range out of the same sensor than Panasonic did. This shows up mostly in the highlights, but there's a teeny bit more in the shadows too. It even seems to show up in raw files, though nowhere near at the same difference level. That said, the Panasonic's image quality is competent. People wouldn't be buying this camera for ultimate image quality, but because of size mostly. Panasonic has picked a nice balance point. Raw shooters will get a bit more than expected from an entry level camera. Gordan Ramsay wouldn't like the many-page, cluttered menus. The menu system seems a little out of place from the rest of the simplicity of the camera. For serious shooters, that's okay; for novice shooters, it's a bit of an overwhelm. Not quite state of the art. The 12mp sensor is showing its age now, and the Venus engine isn't getting everything it could from it. Shooting simplicity. Not much in the way of controls to keep track of, and they're a button press away. Size. Small. About as small as m4/3 gets, and with the right lens that means it'll slip into a big pocket. Value — Here's where it gets interesting. If you've already got m4/3 lenses and are just looking for the pocket camera, add a star. The body-only price is an above average price. 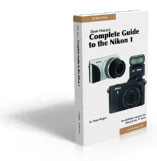 If you're going for zoom flexibility in a kit and buy the GF3 with the 14-42mm X lens, subtract a star, as the high price puts it into competition with better cameras. But here's the problem: if you buy it with the older, big 14-42mm lens the value is good, but you've lost its size advantage. A real dilemma, and one that shows just how trying to break things down into a couple of fixed ratings doesn't work sometimes.